Imagine a situation where your system starts getting slow day by day till it reaches a stage where it almost freezes every once a while. As in most cases of the system slowing down, check the Task manager. It would show some process overloading the system such that the disk utilization keeps shooting to 100%. If the condition happened gradually instead of the system suddenly freezing, there’s a high possibility that the process CSISYNCCLIENT.EXE would be utilizing high system memory. Obviously, this could be checked. 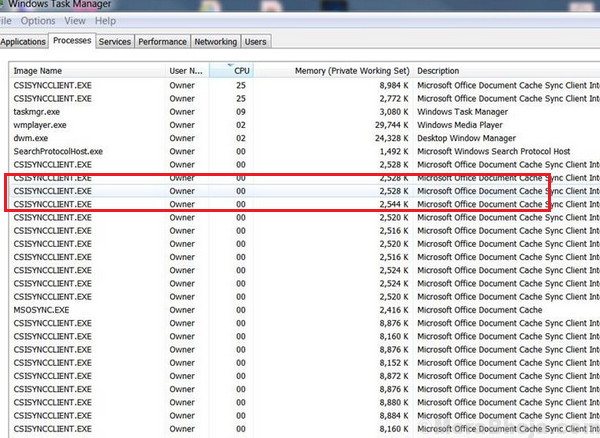 The CSISYNCCLIENT.EXE process is associated with Microsoft Office 2013. The reasons it would be utilizing high-disk space is unknown. There are 2 things: Ideally, this bug was taken care of while launching Microsoft office 2016, if you wish to upgrade. However, that isn’t a free upgrade,so it’s for you to decide. Secondly, Microsoft pushed a fix for the problem in form of a Windows update. Thus, updating Windows would be helpful. A Windows update could help push the fix Microsoft has rolled out for the problem. Here is the procedure to update Windows. 4] Restart the system once the update is done.